University of California Press, 9780520213739, 392pp. Based on fieldwork at the Lawrence Livermore National Laboratory—the facility that designed the neutron bomb and the warhead for the MX missile—Nuclear Rites takes the reader deep inside the top-secret culture of a nuclear weapons lab. Exploring the scientists' world of dark humor, ritualized secrecy, and disciplined emotions, anthropologist Hugh Gusterson uncovers the beliefs and values that animate their work. He discovers that many of the scientists are Christians, deeply convinced of the morality of their work, and a number are liberals who opposed the Vietnam War and the Reagan-Bush agenda. Gusterson also examines the anti-nuclear movement, concluding that the scientists and protesters are alike in surprising ways, with both cultures reflecting the hopes and anxieties of an increasingly threatened middle class. 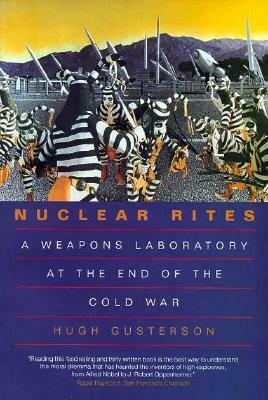 In a lively, wide-ranging account, Gusterson analyzes the ethics and politics of laboratory employees, the effects of security regulations on the scientists' private lives, and the role of nuclear tests—beyond the obvious scientific one—as rituals of initiation and transcendence. He shows how the scientists learn to identify in an almost romantic way with the power of the machines they design—machines they do not fear. In the 1980s the "world behind the fence" was thrown into crisis by massive anti-nuclear protests at the gates of the lab and by the end of the Cold War. Linking the emergence of the anti-nuclear movement to shifting gender roles and the development of postindustrial capitalism, Gusterson concludes that the scientists and protesters are alike in surprising ways, and that both cultures reflect the hopes and anxieties of an increasingly threatened middle class. Hugh Gusterson is Associate Professor of Anthropology and Science Studies at Massachusetts Institute of Technology.